This handcrafted stoneware beehive provides an environmentally friendly, weatherproof home for bees. The local bees will find it hard to resist taking up residence in this handcrafted and environmentally friendly beehive, and they'll quickly set up shop in its natural nesting tubes. 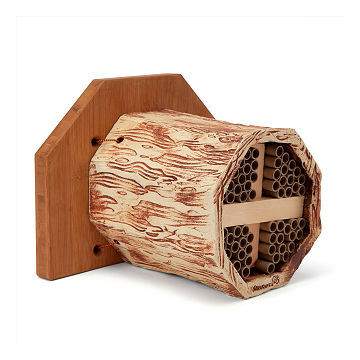 Designed to imitate the natural wood preferred by the Mason Bee (a variety that is non-aggressive and excellent pollinators), this habitat gives the little buzzers a protected place to store their larvae and helps support the endangered bee population. The best part? Sit back and enjoy these humming pollinators as they provide you and your backyard guests with hours of peaceful entertainment for years to come. Handmade by Jo-Anne & Gerald Warren in Canada. Replacement paper bee tubes sold in sets of 80. Great product and really beautiful but box did not include the instruction booklet other reviewers mentions. Would love to get my hands on one! It's a beautiful product and I'm getting another one. Lovely product and feels good to support the bees! My mom loves it and looks forward to supporting a small community of bees. I have not given this to my Mom yet, so I can't speak to how well it works. Appears to be easy to set up and looks well made. Our environmental, college age daughter was surprised and happy to have received such a unique gift. Fun, learning, educational for the life of the bees. Haven't put up outside yet since it is still snowing in Colorado. Can't wait to watch the bees get busy and a learning tool also for my young grandson..